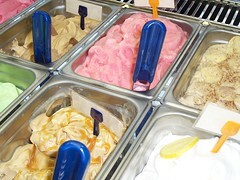 We’ve been testing and serving new gelato flavors at the caffe. The newest ones this week are Quarcream (fresh Italian sweet cheese), Protociocc (yummy Italian chocolate), and Roasted Almond. They are so delicious. You’ve gotta try some soon!